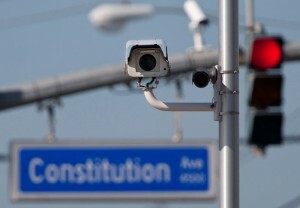 Many states have laws on the books that make it difficult to legally use traffic cameras against unsuspecting drivers. Ohio’s recently gained media attention when lawmakers, in an effort to stop the essential “cash cow” that comes from traffic cameras, passed Senate Bill 342 with the intention of eliminating the use of traffic cameras around the state by requiring full-time police officer presence alongside traffic cameras. Prior to the passage of the bill, Cleveland collected roughly $5.8 million from traffic camera violations. Violators of SB 342 lose local government funding equal to the amount of fines they’ve collected. The new law came after the Ohio Supreme Court ruled the state couldn’t directly ban cities from using cameras based on the constitutional “home rule” and, for some municipalities, it’s definitely working as a deterrent. It’s expensive to have police officers man the traffic cameras, which is why many cities have stopped using traffic camera programs altogether. But, what Ohio lawmakers didn’t expect is the backlash from city governments that have found a way around the new law in the form of speed guns equipped with cameras. The Ohio Supreme Court has already ruled municipalities have, under the “home rule,” the power to establish laws in accordance with the powers of local government, which includes the use of traffic cameras. Did they get it right? Other states, such as Florida, have issued rulings making it illegal to issue tickets via red light cameras, reasoning that cities cannot delegate their police power to private vendors. While others, like Missouri, have ruled that red light cameras shift the burden of proof from the state onto the defendant to prove the defendant was not operating the vehicle at the time of the violation. Red light cameras cause more crashes and reduce safety and do nothing to prevent an accident. While it may reduce right turn crashes, the use of red light cameras has been found by some to increase rear-end crashes. Red light cameras are an invasion of privacy. Private companies typically own the cameras, which means your pictures are stored on private computer servers with no way to track when, or if, they’re deleted. Red light cameras are not the most effective way of reducing red light violations. One study found that between 70-80% of red light camera violations came from the 1st second after the light turned red. Georgia increased the timing of their yellow light timing by merely 1 second and saw a 72% reduction in red light violations. Red light cameras are used primarily to raise money, not improve safety. Ticket recipients are not notified quickly after the offense, putting potential violators at risk for missing deadlines. There is no guarantee of delivery of citation. Even though traffic camera violations are civil in nature, proper delivery is still required. There is no certifiable witness to the supposed violation. You have a constitutional right to confront your accuser; it’s difficult to cross-examine a camera. The driver of the vehicle is not positively identified. Someone other than the owner of the car could have been driving. This seems to be one of the biggest issues and, perhaps, the best argument against legality. Speed guns equipped with cameras allow officers to issue a higher volume of tickets over the traditional route of pulling drivers over. One Ohio city mayor stated an officer could essentially write 1,000 tickets per day if they wanted to. Although speed gun cameras appear to be completely legal under SB 342, using them doesn’t really solve any of the issues surrounding the legality of the traffic cameras in the first place. Specifically, the argument that cities use them simply as a means to generate income for the city can still be made. Further, it seems nearly impossible for an officer to positively identify the driver of a vehicle if that officer is writing 1,000 tickets per day. Two pending appeals in the Ohio Supreme Court put the constitutionality of SB 342 up for debate, but the bill has already passed scrutiny with the Court of Appeals and lawmakers aren’t expecting it to be overturned. Ohio seems to be following the trend, which means accused violators, in Ohio and other states with similar laws, will be able to use these types of laws to fight pending tickets. If a city violated a state law restricting the use of traffic cameras, any evidence provided from said camera would be thrown out. Without the testimony of an officer, a city would have no evidence to fill the burden of proof. Even considering Ohio’s use of officer presence on speed gun cameras, I don’t believe it would be enough to uphold a ticket under that argument due to the fact that officers are often just taking pictures of a license plate without making any contact with the driver.